It wasn't very many years ago when everyone was trying to make a quick buck on a blog. Fast-forward just a few years, and the entire scene has changed radically. Selling advertising on a website isn't as easy as it once was. The "Golden Age of Blogging" has certainly passed, but that doesn't mean monetization has come to an end. It simply requires more effort on behalf of publishers and content creators. Ads Pro Plugin - Multi-Purpose WordPress Advertising Manager is one of the best ad manager WordPress plugins you're going to find. It's a full-featured tool that provides plenty of advertising options on the front-end with a robust toolset to manage ads. With helpful support and video guides, your ads will be up and running quickly and easily. From full online statistics to a useful front-end user panel, the Ads Pro Plugin - Multi-Purpose WordPress Advertising Manager is the ultimate in ad manager WordPress plugins. The WP PRO Advertising System - All In One Ad Manager is one of the more robust ad manager WordPress plugins. It not only includes all the features you would want from an ad manager, it also includes a visual banner designer. From ad sales to ad designs, this turnkey solution is ready to get any WordPress site up and running with a complete advertising system. WP PRO Advertising System - All In One Ad Manager is the easy way to manage your advertising. If you already love WooCommerce, you're going to love the Pro Ads Buy and Sell – WooCommerce plugin. There's no feature bloat here—this streamlined solution leverages WooCommerce to sell advertising. Pro Ads Buy and Sell – WooCommerce isn't just an ad manager for those already running WooCommerce—although very convenient for those that already are. This is a simple ad sales solution that's viable for anyone looking for something more straightforward. Not all advertising is about banner ads. If affiliate links are your thing, you need to check out the Affiliate Links — WordPress Plugin for Link Shortening and Masking plugin. "Affiliate Links is a premium WordPress plugin that allows you to mask any URL in order to create and shorten any internal or external links." There's no need for a robust ad manager WordPress plugin if all you need is to manage affiliate links. This is what you need. With Affiliate Links — WordPress Plugin for Link Shortening and Masking, take control over your affiliate links with widgets, shortcodes, and more. Not all types of online marketing and advertising require the same tool. If content marketing is your game, then Advanced Floating Content is what you want. Don't let your chance float away—get your online visitors' attention using the Advanced Floating Content WordPress plugin. Place your advertising where your web user is looking—videos, images, and text! Ad Overlay Anything - Videos, Images or Text does exactly that, by making it easy to add an overlay over videos, images, or text. "If a visitor to your website is viewing certain content, for example, then they are more likely to be interested in products or services relating to that content. Tailoring your advertisements this way allows you to drastically increase your conversion rates and truly make the most out of your advertising space." The Ad Overlay Anything - Videos, Images or Text is simple, straightforward, and highly effective. Popup Banner WordPress Plugin - Float Banners is perfect for quick and simple advertising. You don't always need a robust ad manager, so keep it simple with something like a popup banner. Setting the minimum width screen width for display is one of the strongest floating banner options. If you don't want to show banners for those on a mobile device, you can easily stop it from displaying with this feature. Prepare your jpeg, png, or gif image file and get the Popup Banner WordPress Plugin - Float Banners started. Advert Flap Pro is one of the most fun ways to display an advert. It's stylish, animated, and easy to use. And best of all, it gets your attention. 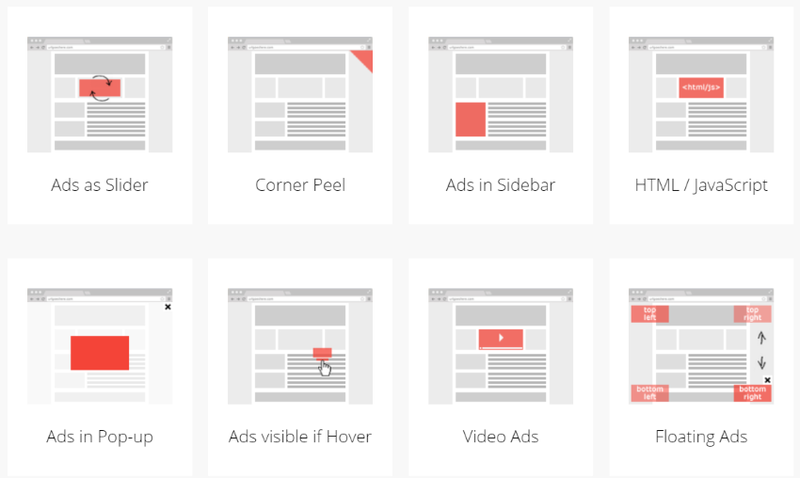 "Advert Flap Pro is an animated advert for WordPress sites. It is one of the most effective ways to get a message or advert out to people on your site without the intrusiveness of modals or popups." With over 23 styles built in, you can add as many instances as you need, schedule, and only display on specific pages. Check out Advert Flap Pro. It's a lot of fun, and if you don't want it to be animated, the static version is clean and sharp. Perhaps the best ad manager isn't a WordPress plugin. Maybe it's you? With the Banners Rotator Generator For WordPress, you can set up and manage your own ad spaces. Banners Rotator Generator For WordPress is a quick, easy, and simple way to add and manage banner ads on any WordPress site. An ad manager WordPress plugin won't help if web users are using AdBlock—blocking revenue-generating advertising. Fight back with the AdBlock Monetizer - WordPress Plugin! "This plugin is able to detect adblock software." This plugin allows visitors to view your website content with AdBlock enabled, if they agree to pay. Otherwise, they must disable AdBlock to view your website. AdBlock Monetizer - WordPress Plugin not only offers websites some relief from AdBlock, but also educates websites on the real cost of ad blockers. There are many different ways to monetize your WordPress website with advertising. While a robust ad manager WordPress plugin may very well be the best and most effective way for many, there are still those that would greatly benefit from a unique approach. Before diving in and purchasing the most robust solution, make a list of what you require and a list of what would be really nice to have but not essential. Once you've got this done, review this list and see what solution works best for what you need—and maybe even a few things you want. Envato Market has many different advertising WordPress plugins that may also be helpful, as well as some great advertising how-to tutorials and a wide variety of helpful eBooks. What are the most important features you look for in an ad manager WordPress plugin?